This is probably the closest one can get to make such a special book into a successful movie! The movie completely follows the book (alterations have obviously been made) but still never bores you. I loved it as a child & I still liked the movie 8 years later when I read the book. The kids in this movie, can't deny look younger than 11 years old but yet i have to appreciate the casting. It was very appropriate. The movie also gives the young kids an experience, they'll want to re-watch many times. Harry Potter is due for his second year in Hogwarts, for those of you who loved the first part will also like this one, however, as a kid I never really liked a few creatures of this movie, Aragog, Dobby & the Basilisk were to creepy for me, but thats my personal opinion, you may like them as many others did. The climax is one great treet, yet it leaves a few parts untethered and still leaves room for improvement. This is the best movie in the whole series, The director was replaced but thankfully the charm wasn't. The twists and turns, the slightly scary climax, the unfolding of the story & finally the effect it shares with the book makes the movie "enchanted" for me. Nothing goes wrong here, the new Dumbledore (Michael Gambon plays the role, after Mr. Richard Harris died in 2002) whose face itself shows the power he possesses and finally the casting of Sirius Black which is again so accurate. It comes as my personal favorite. Also acting by the supportive cast is one good treat to mention, Oliver and James Phelps bring the character of Fred and George alive, no one else would do better than them also a special mention to the dementors, they've too done justification to their roles. Worst after the best. This movie doesn't follow the book well, there are alterations and additions everywhere. The director conveniently removes minor and majors chunks of the book to add his own. The first half is good & visually appealing, though no there was no importance given to the book's facts. For instance they show the students studying in great hall, or a boy (an owl is the mode of delivery) delivers a parcel or all the students from all the classes assemble in Professor McGonigal's classroom! These things won't pinch to the one's who haven't read the book but The climax is the wackiest of the lot, the director hopes you understand the misterious death of Barty Crouch, you also are supposed to be believe that a person rises from the death bed! Apparently, there was one scene where the director shows Barty junior conjuring the dark mark, harry could have told dumbledore 'bout that but he didn't, the director thinks it was as though completely trivial to know how a supposedly dead man could be alive! Still, This movie works for those who want entertainment & don't mind seeing anything even though it has got loopholes (manholes here) after every almost 15 minutes or so. The parts of the triwizard tournament are entertaining and also where you really tend to ignore the mistakes. P.S. The movie keeps on appearing every month on HBO, I really don't know why they don't show better Potter films for a change! Many regard this movie as the worst of the Potter films till now, I disagree. Harry Potter and the Order of Phoenix is a safe movie with a bit of humor (added in places by Oliver and James Phelps), and keeps the key things in tact. If only the movie fails, is because of too many things happening in one time. The movie cannot be blamed for its slowness because if you've read the book, you'll understand the book itself was a bit boring, yet you don't feel the pinch. It has a well written climax, a powerful battle between Dumbledore 'n Voldemort is also a treat to watch but here the director doesn't focus much on the prophecy part of the book (in the end) where as it was a very important one! It follows the Goblet of Fire Path. The screenplay (Steve Kloves returns here) is altered badly. Figures of Speech have been changed completely the thing which could have been included in a breath taking climax as a suspense, is given knowledge about from the beginning. The facts were never so irrelevant in a Potter movie.I would give casting a special mention the director casts Jim Broadbent for Slughorn which isn't really very real to the actual Slughorn. Still it gets its numbers for the fact that when I had watched the movie I was yet to read the 6th part but still it had appealed to me visually. It looked pretty entertaining and the Climax was one of the best. The cave part was seriously done well, though they showed inferi as dangerous (the're innocent dead bodies) but doesn't really matter as you still remain at entertainments receiving side. Anyway, its just much better than Goblet Of Fire at least you aren't left unanswered this time. The Reviews done, so the whole series all in all is good. I couldn't imagine the world of wizards that easily if I wasn't supplied with these movies. Every saga has its ups and downs but still I like every character and actor of this movie series. Though a Special mention to Dobby's Character who was shown in just one movie, he has a much bigger role 'n thus when he dies in the last part, you really miss him. On final thoughts, I must say read the books first. iPad an oversized iPod Touch? Not really! I really don't want to comment on the iPad news twice, i had actually stated it as a good device with some minor problems which will be corrected in due course of time but it seems my last article was short of one thing, the iPod Touch 'n iPhone factor! I must admit i couldn't collect all the points that time. So here i am with a much detailed article, on why iPad works and what makes it a bit of a problem. Also you get a clear picture of what this device talks about. According to Techtree: http://bit.ly/basm7I, the iPad looks like an over sized iPhone, first of all, iPad should be compared to an iPod Touch not an iPhone as it would be very awkward for us to hold a giant clipboard towards our ears, think! Next, if it runs a modified iPhone OS, I have no problem (neither should the masses have) until it fails to perform the tasks it specializes in. It is better having an iPhone OS on 10" screen than having a crammed up version of the MAC OS X which certainly would have impressed many critics. This reminds me of multi-tasking which for once is a problem with iPad but you can ofcource listen to songs while doing your work, read the email from where you had left last time & continue with you're work in iWork even though you hadn't saved it the last time you pressed the home button! Still the problem is, there is no easy switching between these apps, which i would suggest, can be corrected by popping up the bottom semi-transparent tray to let navigate through running programs. Again, Would you prefer a super fast iPhone OS which does the work very easily or a crammed up slow PC software or MAC OS X? I would prefer the modified iPhone OS to a slow and crammed up MAC OS! Lastly, do you really believe iPad as an over sized iPod Touch? Can you read a book so easily with your iPod Touch? 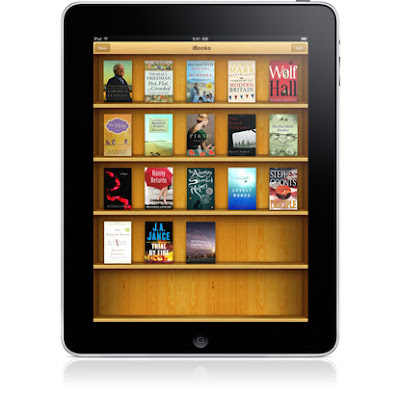 Will the e-book experience be the same with iPod Touch as it is on iPad? Will iWork work on iPod Touch? Will iPod Touch ever be able to provide the same photo viewing experience as iPad? Does the A4 Chip from Apple = Samsung 32-bit RISC ARM 1176JZ(F)-S v1.0? The answer to all the questions above is just one: No, The iPad is superior at doing that! "Remember, it's meant to be better than a netbook." Did the thinkdigit writer really go to the conference? 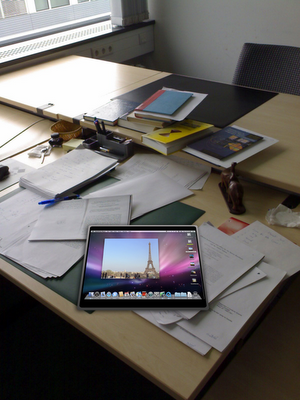 Steve Jobs discards Netbooks as being cheap laptops, he never said his iPad will be better than a netbook. It could never be, but undoubtedly the iPad has an edge over a few points: "Browsing, Email, Photos, Video, Music, Games, eBooks", When did you ever see a person being able to play NFS Shift on a netbook? Secondly he points out at no flash support. Which is more or less a true but Apple has started a venture with Adobe which allows the Flash CS5 (will be released by spring) users to create Flash games and programs for iPhone OS platform & of course if you haven't experienced iPhone, you wouldn't know the iPhone supports Flash ads and also we have spotted Flash video running in iPad's Safari in one of their ads, so i keep my fingers crossed on this one! No USB Port.. No SD Card slot.. No HD-Output-hmm... is this meant to be a laptop of sorts? Essential peripherals sold extra. My definition of essential has never included an extra keyboard when you already have one on the screen, neither does it include a dock when you are supplied a full charger. Another iPhone type Operating system...eh? Read the above article carefully! If you've ever used Apple apps, they've got class, they're store is much better than the so called "Open Store" of Google and Nokia and yet they provide 140,000,000 apps and more. Lastly if you need the iWork to be free of cost or atleast be embedded in the iPad by default. Have you ever heard of an Office Suite except Lotus (which is open source) to be free or embedded in your computer by default? They're right on one point though, the camera will be missed, this device would have become a dream device to conference with its inclusion. I want a camera in the iPad V2. And again will 64GB be enough for the world? I think you're not going to have more than half of it filled once you work on it. I don't question the writer's opinion but it is my take on the two very trusted websites of India, which are giving information on iPads without deeply studying the product (again my opinion). Many who have experienced the iPad in they're hands don't go by its looks. 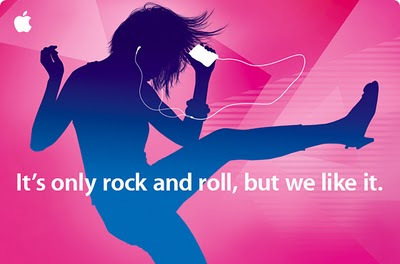 I am no representative from Apple but still I accept the device for what it gives us. iPad is just as cool as iPhone (don't think i'm comparing the two) but as the iPhone had a few problems in the beginning the iPad too has them. This device has got a few minor and major problems which may be rectified by the next version of iPhone OS. Don't yet loose you're heart fan-boys and neither do these bashing reviews about iPad provide any inside. We have to wait for the final product to draw the conclusions 'n don't forget there's always room to improve! On Final notes iPad has the potential to replace the paper, even without an e-ink display! Please note that I had no intentions to harm the reputation of the two sites I mentioned above, these sites are free to express they're opinion and remain one of my favorite sites till date. I was just giving an example of the web chaos about this particular Tablet 'n trying to sum up the info. I'm probably very late in writing the review (the book released back in 2005) but as I had taken up reading just months back 'n my first series being Harry Potter, I've finally read the 6th part of this epic saga! What lies ahead is a twisty part... which i don't want to think about! 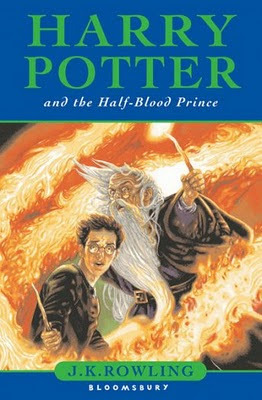 Coming to the main part, the 6th book, the half blood prince! Harry Potter the boy who lived, the chosen one is all set for his sixth year at hogwarts! Lord Voldemort is back in power he is still alive and all Harry is doing at school is having special lessons from Dumbledore who is giving him an insight to the memories involving Lord Voldemort! Is this important? Yes, as the book goes on you'll find it is! Meanwhile at hogwarts there's a new teacher, Horace Slughorn. Old Sluggy gives Harry a used book to do his classes, surprisingly the author has done out cuttings and scribblings which are very useful to Harry. The book belongs to the Half Blood Prince. I haven't read such a book ever, it is surely one of the best books of all time, that was just a small overview of the long yet exciting adventure of Potter. It has everything which makes it an epic saga. Not even a single word is useless every word, every sentence's got its ties in the later half. I read one chapter per day but I can't deny that I wasn't tempted in what will happen next! Who said only visuals take you to a ride, where you feel one of them? Books do too. While reading the book, I felt I was one of them, the wizards. When he and his friends felt happy, sad, angry, when they cried... these feelings were felt by me! Really how a book should be, it makes a connection between the writer and the reader, which sadly wasn't in the movie of the same part. A book which inspires others to read! Rowling has spun the world with such perfection it's hard to believe it doesn't exist! The book is just 607 pages long, but takes you through a journey you wouldn't have experienced ever! Joanne Rowling also gives out words of wisdom all through the book, the book has highly effected my vocabulary, my English was never better! At the end, if you haven't read this one, or stopped reading Potter books from the 5th part which was boring or you don't like teen books, read this one for starters, you'll become a fan of reading. Yerba Buena Center of Arts in San Fransisco was the place to be yesterday! 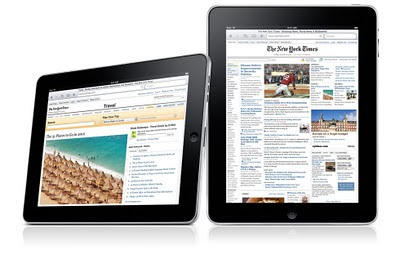 It experienced something Apple fans had been speculating for years, The iPad. Yes the Tablet we have all talked about for years was finally announced. Sounds like a device we dreamed of for years but wait until you hear the reception from those anticipating its release. Lets come to it straight away the product clearly states an "i" in the name, what does that mean? It means its neither an iPhone nor a Macbook its different! Its an innovation! Don't expect it to work in case you're hoping to buy a small laptop. Its not meant to be that (Though, we wanted it!). Apple iPad is a big iPhone, running an iPhone OS 3.2 with capabilities nearly matching a netbook. Yes at around 20,000 bucks the iPad comes with nearly netbook capabilities, still you like it! Its the feeling which is more than any thing else. What iPad does is everything that an iPod Touch couldn't do, with its small screen interface yet it is not your new third Mac! You wake up... take a cup of coffee to your dining table, there's something else on the table in a nice case with a half eaten Apple logo on it... You open it, no need of the newspaper mate! It's in there... you skim through the headlines then pick it up, place the cover, keep it in your empty school bag and go to school ------> In school u open it, read your text book from the shelf and take down notes.-----> Back at home it's time to read your copy of Harry Potter, you open the iPad again and read it! Finally you can do the homework with pages and then play your favorite game! All that without any paper work, and without having the hassle to switch on your PC or Mac! The possibilities are endless, only if you understand how to use it! I'm worried about a few things though, the OS for instance is a let down for the iPad but you need to wait, remember when we got the iPhone? It didn't even have SMS forwarding or MMS but now it has! even a Video Camera is present! You need to wait for the next software update we might see a multitasking iPhone OS in our hands by June. The reception by critics and fans wasn't good, they've disproved of the product completely but they need to understand what this device can do, you cannot deny apple hasn't improved they're products in the past, this too is bound to do the same or they'll fail. I still keep my fingers crossed for the final product may be it improves somewhat! P.S. : It raises my expectations for the iPhone too, are we going to have the same OS? The same apps? If they're there. iPhone might just take over as the best phone ever! And the Earth Keeps spinning! Read it Live! Apple's new creation! So what if you couldn't get the invite of the Apple event at Yerba Buena Center of Arts. You can read it here, Live! Coverage done by Cover it Live! Last week I had been very busy, 18th was the beginning of the exam stress, we had Science Practical that day....20th was SST UT ... 22nd Computer practical... 25th Maths Practical, the long list continues till the 27th when I have my Computer UT, they just don't get over :( , yet last night I got a chance to watch a movie! Paa was one of the many movies, i didn't watch at the theater last year, it came in the busy season of December where every week a movie was released so I chose to skip the movie. Well now its on DVD and I've got a copy of that! Auro(Amitabh Bachchan) is an intelligent and witty 12-year-old boy with an extremely rare genetic defect callled progeria. Mentally he is 12 very normal, but physically he looks five times older. In spite of his condition, Auro is a very happy boy. He lives with his mother Vidya (Vidya Balan) who is a gynecologist. Amol Arte (Abhishek Bachchan) is young, progressive and a full-of-ideals politician. He is out to prove to the world that 'politics' is not a bad word. He is a man with a mission. Auro is Amol's son however Vidya conceals this from him. When Auro does learn the truth however, he wishes to go to Delhi with his father. Auro tries to get his mother and father back together but Vidya resists, still hurt by the fact that Amol wanted her to have an abortion when they first found out she was pregnant. Amol realizes his mistake though, and proposes to Vidya, as he is still in love with her. He stays by Auro's side when he finds out that Auro is his son. Auro's health begins to deteriorate as he reaches his 13th birthday, his physical defects catching up. However, he is finally able to reunite his mother and father once again as Vidya gives in to her feelings for Amol and her motherly love for Auro. Auro, succumbing to his disease, dies happy, his last words being "Maa" and "Paa." So thats the wiki version of the story of Paa, which is no doubt, different. Yes, its no copy to the Curious Case of Benjamin Button, which was one of the reason I didn't want to watch the film. Paa is one of the rare films where the story doesn't matter much, the screenplay does though! It's only for the screenplay and the great acting by Amitabh Bachchan and Vidya Balan that this movie survives! Amitabh Bachchan as Auro does an extraordinary performance playing a kid, you don't realize until the rolling credits appear that Amitabh Bachchan acted in the film. Paa never fails to touch your heart in the emotional sequences, thanks to Vidya Balan who after Bhool Bhulaiya has done her best in this one! Sprinkled with light comedy, the movie never loses the grip, even though its far too predictable and the climax is "announced" in the first half! The worst bit comes in the form of casting, where Jaya Bachchan announces the names of each and every crew member! Perhaps I would have left the theater for a walk until that was over! Abhishek Bachchan is the Tata Jaago Re Brand Ambassador, he's playing the neta of our dreams! always working for the benefit of the people. This doesn't work! This ought not to be very obvious, but that's still fine. The problem with London Dreams was that its story demanded a screenplay of not more than 1 1/2 hours but the movie was dragged to be made into a 2 1/2 long and boring movie, that has happened with the many disasters of last year. Paa doesn't work on that track, its just 2 hrs long and yet gripping! Music from Ilaiyaraaja (he won the Padma Bhushan today) is good, it blends with the movie well! Finally, I would still say "Watch the movie" because the acting from Amitabh Bachchan needs to be appreciated and its a very well made film with good music and good screenplay and editing. Add to it the light comedy. Yes, Predictable but still It is surely one of the finest movie! It's not a copy of Curious Case of Benjamin Button, you can surely have it on home video if you've not seen it in the cinemas! Consumer Electronics Show 2010 held in the first week of January was a complete let down if you look at Tech Giants like HP, Dell, MSI, Samsung and Microsoft. Google however launched their mobile device (manufactured by HTC) Nexus One, whose leaked pictures where all over the internet months back. Starting with the craziest lot this year; The Tech Giants. Each company begins with a motive show something original, something new or even different sometimes but a few of them seam to have lost their path somewhere this year. The CE show is meant to showcase the new advancements their making to the technology world. However the laptop and technological device section was miles away from originality factor. 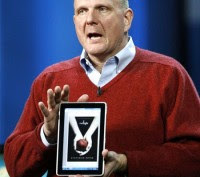 Microsoft was perhaps scared by the rumors of the Apple Tablet launch. They have for long cheated Apple's software but the point here is the rumored tabletmac which was confirmed by WSJ recently. Around time that Microsoft realises that their company was not made to copy Apple but to provide the world with good technology. Times have changed, everyone knows the inside news. Microsoft made a last minute announcement that they will be launching the HP slate. HP slate was just the beginning of this crazy ride of slates going on, apparently 'iSlate' is the rumored name of Apple's tablet device so all of them named it their slates. 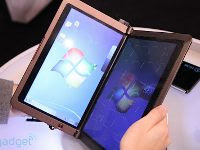 Other companies were busy launching awkward devices all of them named some sort of slates and more prominently ebook readers or classwork books. The event seemed more to be an attempt to upstage the non-participating giant Apple Inc.
Apple Inc. wasn't only the CES target, internet shopping site 'Amazon's ' original book reader was redesigned by MSI, copied by Samsung and others merely gave this as a special feature to their 'slates'. These were the let downs but HEY, not every one makes a slate. Google's nexus one's images were leaked weeks ago. At this time if there is a phone which competes iPhone 3G S. It is this one. Google isn't like the NOKIA's or HTC or Windows Mobiles which just try to rip off iPhone capabilities and end up being Sued! Google did something different this time, perhaps the right way. They established their Android OS platform in the later half of 2009 and now have launched this mobile which has a stable OS, something different and something borrowed from iPhone. The phone is no sub - standard iPhone copy with these many features but you still can't tell about the 'touch' experience. Is it like HTC's or Apple's ? Only reviews will tell that. TV was also running on the footsteps of Tech Giants. One company (can't tell which one, as every one launched the same thing together) came with an idea of 3D TVs & others replicated it. Sony, Toshiba, Onida all fall here. Had they thought in providing better services in Television rather than this crappy stuff, giving 3D glasses to people and showing them how their premature 3D television works. Almost everyone provided the same. The idea itself is astonishingly crap. 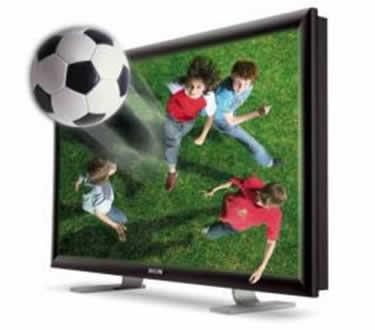 Showing 3D on TV is nothing but showing off what you can do today. 3D can be appropriately used to make environments which make you feel you are at the very place itself, none of which I saw this year. Only place you feel here is the Pandora of Avatar on your Television or Computer screens. I won't like that myself. Cameras also have started providing HD recordings (1080p) at cheaper rates but nothing much interesting was there. CES 2010, Las Vegas won't last as a groundbreaking memory at all but as an attempt to copy each others work. The sincere use of technology was never on display. There was no attempt provide utilities rather they've provided nothing new. 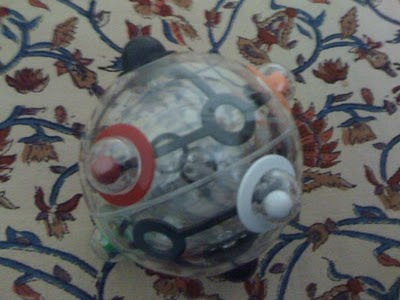 I just got a new companion on my table yesterday which replaced the Rubik's Cube; Rubik's 360. While I write this article, I'm also solving my new Rubik's 360 for the second time. All around the world, there are still many people who find it difficult to solve the Rubik's Cube. Most of them might also think that it has been unsolved to such an extent that it is impossible to solve it back. Let me clear this first, any of the Rubik's puzzle (Cube, magic or even 360) is possible to solve from any situation of the game and all of them have only one solution. It took me about 11 hours to solve this mind turning puzzle. Clearly the game requires a lot of handwork and angles. It is not the kind of the old & easy to solve cube, which I can solve in precisely 1 minute 51 seconds. The game looks simple at one go. 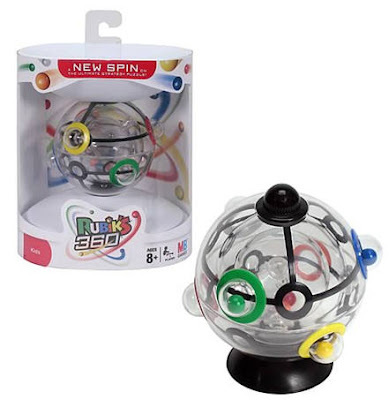 You just have to tilt the 360 so that the balls in the inner sphere reach their slots but as soon as you take it in your hands you realize that this isn't easy at all. There is one more hurdle, a weight has been placed in the innermost sphere so that balls get attracted to that, and the it's whole is just opposite that. Clearly it looks impossible from this angle. The game is tough but not impossible. If you work out the solution it will become more and more interesting. One more thing you need is concentration. If you don't focus on the game, the ball won't move out of the middle circle. 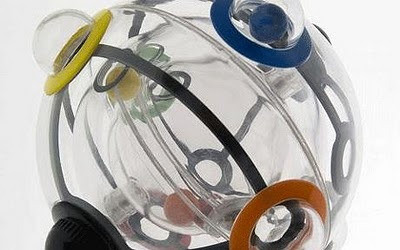 It is also how you, use your skills to decipher the ways to overcome the forces applied by the metal ball. I myself have now solved it 6 to 7 times, like the cube this one is also engaging and challenging but it's quite delicate to carry along any where. Even the size is large which makes it's handling for kids a little difficult. It's Always good to see the Inner sphere without balls! Other than these few limitations of playing, it makes a good replacement to the cube which till date remains at our desk for anytime entertainment. The same magic however wasn't created by Rubik's Magic which was for some reason not launched in many places including India. Rubik's 360 in India is very rare. In Delhi the only known place to have this game right now is 'Ram Chander & Sons Toy Shop' in D Block CP. (Quite tough to go there these days). You won't even find it on ebay. The shop is small but you'll be able to find any game for any console and any toy or puzzle. Erno Rubik said in an interview "If you find Rubik's Cube tough you'll find this impossible". Surely it is tough. So you must have a lot of practice on the Cube before you begin solving the 360 puzzle. 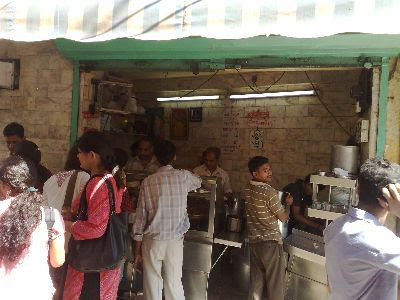 The Rawalpindi ke Chole Bhature Shop at Kamla Nagar, a.k.a Chachaji Ke Chole Bhature is the one place to be, if you are planning to eat chole bhature in North Delhi. 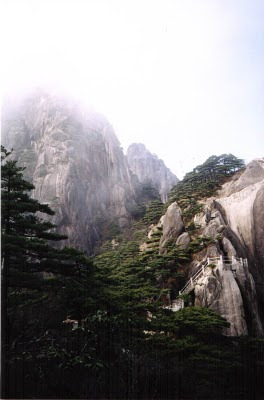 Most of you reading the article will know about the place I'm talking about. It's the cramped up shop in Kamla Nagar's bada golchakar area near the famous Baskin Robins. The shop is small, so is the area around it. There is no seating space, or A.Cs running (heaters these days), but only one big counter under which one big handi of chole is being cooked. The Chole Bhature are served to 2 huge lines of people until 3:00PM. So how's it different from any other food shop in the DU(Delhi University)?It's perhaps the food you get here. These Chole Bhature are the best in the world (apparently you get them only in India!). The food here cannot be expressed in word but is to be tasted by you itself. The imli ki chatni and the special aloo ka bhatura you get here is invincible to any other, you'll get. The Chole's are to be mentioned seperately! I don't know much about the secret ingredients put in that but they mesmerize you to the core! A place in Delhi that serves such great food is likely to be a hit in a few minutes of its opening but the fan following doesn't remain in the span of 5 years of college graduates from DU, who studied more than 20 years ago also come and eat here. That's the reason of the huge tide of people coming to eat here, till the very last. Dad was among the first to have discovered this joint in DU. He remembers the time, it used to be the same rush of people coming from every college & eating here. Then it was a DU oriented joint, now the scenario is much more versatile. 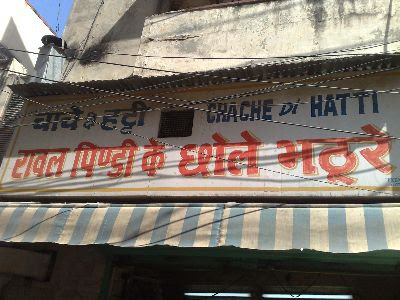 I've been eating here since my childhood & for long have been a fan of Chache di Hatti at Kamla Nagar. I remember the McDonald's & Dominoes employees coming here and have their lunch, when their shops once existed near the Hatti. While it might get tough competition from Sitaram at Paharganj and some eateries in the South Delhi, it remains my all time favorite! 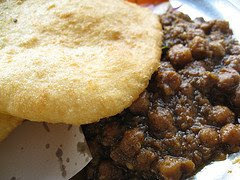 I recommend all to go before 1 in the noon to be fortunate enough to feed yourself with the delightful feast of Chole Bhature, as they say "Good things come in small packages". Recently we saw(& read) all that shouting going on the blogs, websites, and news channels, about this awesome film '3 Idiots' not giving credit for taking 5.Someone. I've found out 3 very useful items which prove the filmmakers right! Perhaps, the newswalas read it and show us something else! please we need more important news than this fighting! SPOILER ALERT : IF U HAVEN'T SEEN THE FILM, PLEASE DON'T READ IT YOU WILL BE DISCLOSED TO THE AMAZING TWIST'S AND THE CLIMAX OF THE MOVIE! The truth behind Apple's Tabletmac! Last time before the September 9th event, all Apple fans had their hopes up for the new Tabletmac. Their hopes were shattered and smashed just after they saw this board! :D : Music Event! eh? You probably don't expect a laptop or Tablet PC to be released here! So again the 2 year long hope of a Tablet PC from Apple were shut in the box. Come this december and again the rumors started flying. http://t.sina.com.cn/kaifulee ; This is the link to Kaifu Lee's blog! Who's Kaifu Lee by the way? He is the ex-chief of Google China. This person states in his blog that the new device will weigh less than half as much as a MacBook Air, though it was unclear whether the message was speculation or came from Lee's friend. Having said that, Lee wouldn't have had any actual experience of the device he is talking about as Apple inc. is always very secretive about their products until the very end. The Tabletmac in this case is my speculation of the new device coming from Apple. According to me if there is an Apple Tablet in there. This is the most likely version of the tablet. Finally, we are at a point where nothing is sure. This isn't to say of the confirmation of the Apple Tablet but we still can't deny with speculation from media running faster than ever. The 26th January 2010 event exists & there will be a mac release in this(according to paterns).I suspect that Apple is decreasing its prices not that the economic recession has eased off & Apple will be upgrading the specs which are quite drowsy at the moment! Also I am hoping of a new product launch this month from Apple. with the militants. Now this guy Jake Sulley is acting spy to Pandora natives. Soon their Avatars are ready and Jake Sulley's brain is teleported into the brain of his avatar he controls the avatar when he is asleep. In his avatar he is meddlesome and gets into a lot of trouble with the animals there. Then he meets a Pandora native (can't remember the girl's name), he is tought by her, the rules of Pandora while her collegues don't approve much of that. Here is when the story gets slow, and we start feeling why are we here. before the Intermission and we find, the US militants are here to take Unobtanium from Pandora which on a sacred tree, which is actually the home of Pandora vasies. They won't hesitate to kill the alien bread (like they ever did). The war begin's and so does the most interesting part of the movie. The movie is such well loaded with gr8 backgrounds that you forget about the acting. Now Jake Sulley's mind changes and he starts helping the natives. The story is predictable and so is the movie. Its the extensively imagination of the writer and the way it is projected on the screen, which saves this movie from an ultimate wreckage. 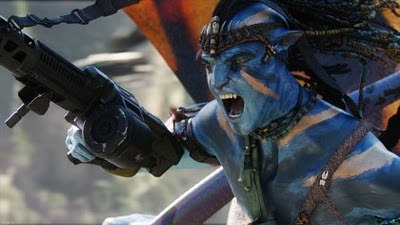 I guess it is the entertainment value of the movie, not the base script which is more gripping here & ofcource not to mention the imaginative world spun by James Cameron. Like it for the experience of an outside world in the cinema. I recommend to watch it in 3D.